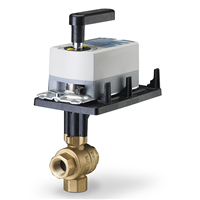 3-Way Motorized Ball Valves Brass Trim. SIEMENS 0.5" 3W, BALL VLV+GDE131.1P 3 Way Mixing, Diverting Ball, Chrome/Brass Trim. SIEMENS 0.5" 3W BALL VLV+GDE131.1P 3 Way Mixing, Diverting Ball, Chrome/Brass Trim. SIEMENS 0.5" 3-Way, BALL VLV+GDE161.1P, Chrome/Brass Trim. SIEMENS 0.5" 3-Way BALL VLV+GDE161.1P, 3 Way Mixing, Diverting Ball, Chrome/Brass Trim. SIEMENS 0.5" 3-Way BALL VLV+GDE161.1P, Chrome/Brass Trim. SIEMENS 0.5" 3W BALL VLV+GDE161.1P 3 Way, Chrome/Brass Trim. SIEMENS 0.5" 3W BALL VLV+GMA121.1P, 3 Way Mixing, Diverting Ball, Chrome/Brass Trim. SIEMENS 0.5" 3W BALL VLV+GMA121.1P, 3 Way,, Chrome/Brass Trim.